Obtained! A beautiful shiny Roselia kid! He's such a stunner...I love the colors so much. As the first shiny I caught in the game, Roselia means a lot to me, but I think he's also one of my favorite shinies, period. 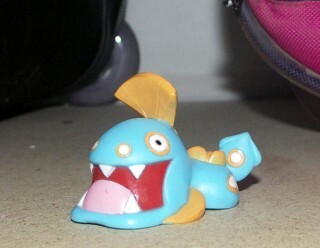 Now that I have him, I'm moving on to my next grail--the elusive shiny Gyarados kid. 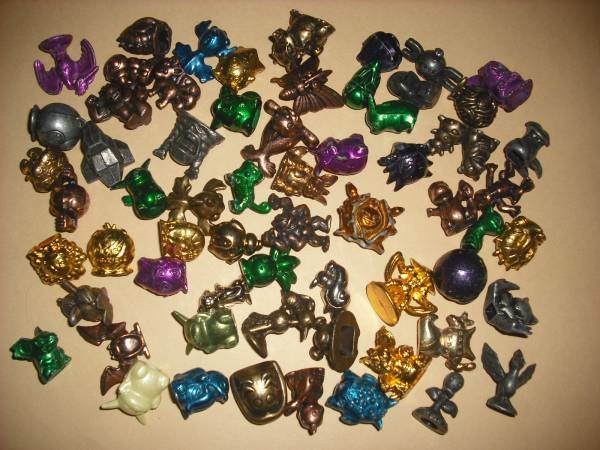 I know it's super rare but for whatever reason (probably because of its popularity) it's proving to be even more difficult to find than most shiny kids, so I'm prepared to pay an arm and a leg for that one. If anyone has the above for sale, please let me know! Also, there are other kids I'm looking for but aren't as high on the priority list so if you have other kids for sale, I'd love to see a list/pics! There are still some common ones I need but would prefer to save on shipping for those and buy them in lots. One (well, two) last wants--I'm looking for legit copies of Pokemon Emerald and Leaf Green for GBA. They don't have to look brand new, but I prefer the labels be in tact and such. There are so many fakes on ebay that I just don't trust it--I'd much rather buy from the community if possible! Is this the English version of Plasma Gale or another expansion? (EDIT: consensus is this is Freeze Bolt and Cold Flare) I've been holding off buying the two Plasma Gale Victini EX cards since I want to collect mainly all the English versions. Currently I have every English Victini card and one Japanese card that was never released in English(might not be legal for playing the TCG?). 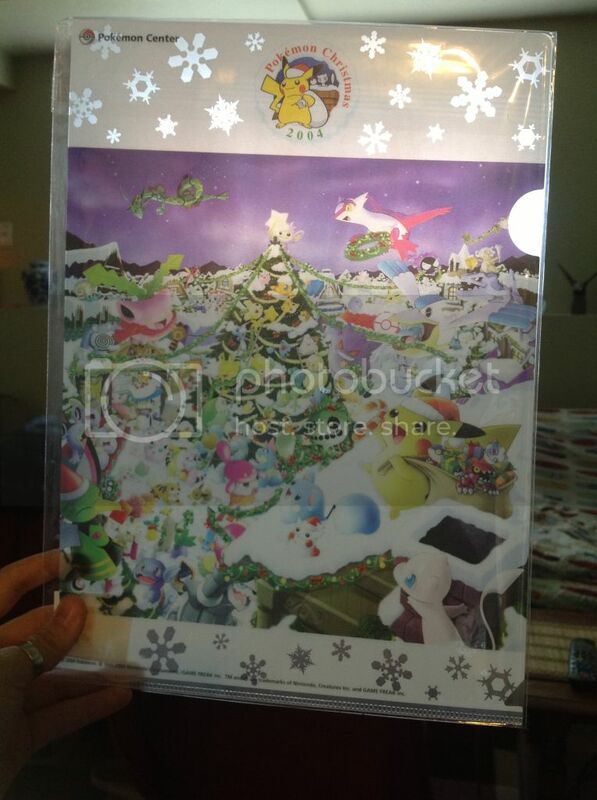 Some new sales and Xmas 2004 clearfile for offers! Hey guys, I just wanted to let everyone from my previous sales know I have shipped everything out as of Wednesday! Thanks so much for helping me out! There are only 2 packages that have not been shipped because I got payment after I shipped everything else off so I will be shipping those 2 packages out with my upcoming post office run after this sales post. Hey all this is just your one and only reminder that the Jakks Eeveelution auction ends tonight! Hello all! I'm back with updated sales, new items, new prices, and even a few lots! 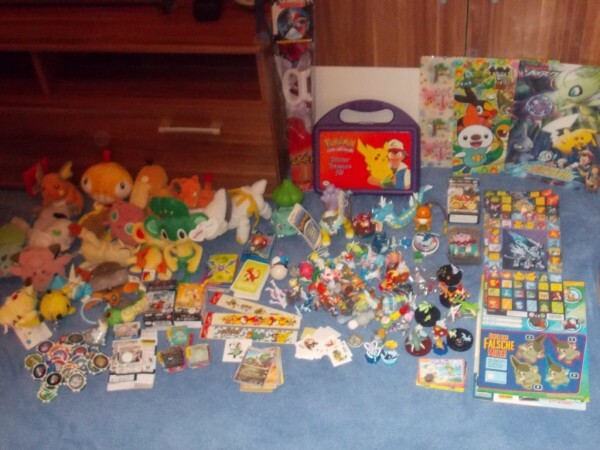 Anywho, I still have quite a bit left over from the auctions and after buying the Lotta Pikachu Collection set of figures on Y!J auctions and it costing way more, I need to get this stuff out :P.
Auctions! A dozen kids and two rare cards! 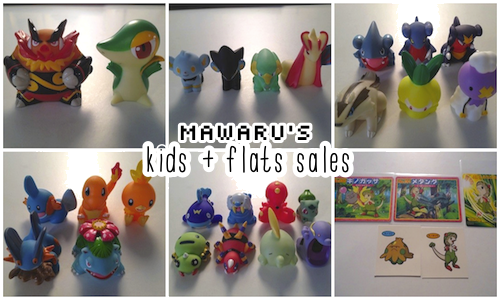 Tonight I have twelve kids figures and two rare cards to auction off! The auctions will last for eight days, ending on Sunday, October 28th at 8pm EST. I have more weeding sales for you! There's Kids and some uncommon Breloom flats! I checked through the kids and info tags but came up with nothing. I might just be terrible at searching, of course. Has anyone seen pictures of the Genosect Arc kids set? I'm seeing that there's a Zangoose in the lineup (among more popular ones like Leafeon, Jolteon, Flareon and Glaceon! ), so I'm wondering if I should try preordering a few boxes, or if it's just going to be a rerelease of earlier figures. Im also interesting in knowing other tomy plush that where in this style with the bag. And again any jirachi items I'll buy. Payments 1 due for New Nasija GA! PLEASE READ THE RULES BEFORE PAYING!! - Payments are in the BLUE column! - Please EDIT the spreadsheet, add a yes that you have paid AND your location, so it will be easier for me to calculate shipping, when the box arrives to me!! - Once you do that, please write me a comment that you paid as well! - MOST IMPORTANT THING!!!! Payment has to be sent WITHIN 48 hours, NO EXCUSES or Negative will be left!!!! ALSO, nasija HAS to receive my payment for this before Monday, because she has a business trip the entire next week!!!! ☺ I can also take Amazon giftcard or ?? just ask! ☺ I can't be responsible if Postal Services loses your item (I will provide proof of shipping). 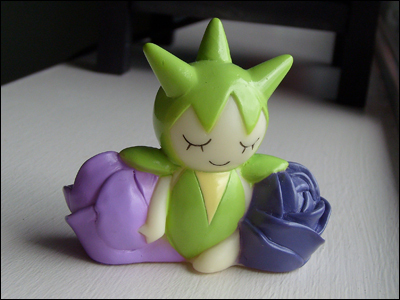 Hello there pkmncollectors! I come bearing commissions and wants! I'm doing ACEO commissions, which are basically art cards the size of Pokemon cards. If you're interested, click the Espeon below to be taken to the information page! 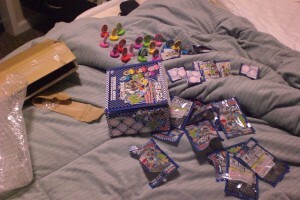 I was granted sales permission from dakajojo on 5/22/11! 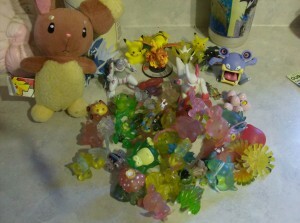 Also, thank Arceus, my wants list has been shrinking! Gah, I feel a little bad for never posting. ^^" I just guess I'm kinda paranoid of being given the n00b-stamp for...over-activity? Yikes. Oh, well. Back to the point, I've finally mustered the muse to make a collection update! Yay! Although, I'd have to admit it hasn't grown in the last few weeks, I have gotten a lot of new things since my last post! I presume you're sick of my yakking, so I'll get to the pictures lol. Hi, everyone! The invoice is in. We got giant discounts - the total bid was $255 and the invoice is $53.45. Payments are due in 24 hours. (48 hours at the most.) No exceptions. The spreadsheet has everything you need - the amount you owe and the email address to send it to. Please put Suicune Stampin' GA - [username] in the subject of the paypal line. To chespin, rainyan and pacificpikachu - I need either your postcode (if your shipping address is in the US) or your country (if your shipping address is outside the US). Thank you for helping to make this GA a successful one! Feel free to shout out the Pokemon you found in this lot 'cause I am doing the same thing right now. I'm still on a search for a squirtle cel, but if you have any other Pokemon cels up for grabs, I'd love to see! Also, I really want a pencil bag, the rounded ones preferred. Thanks for reading! Hello everyone hope you're all doing great! 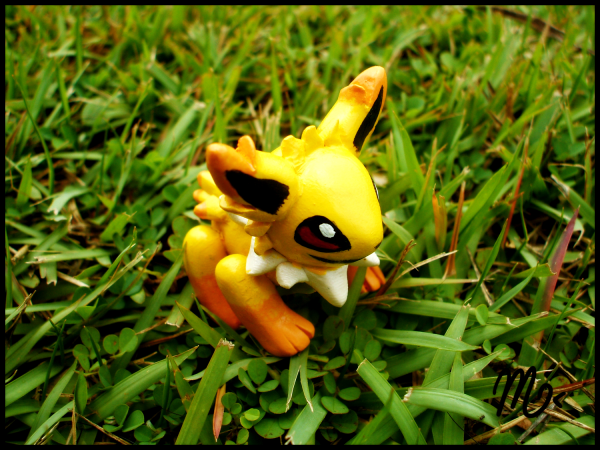 Today I bring you pictures of the adorable coolness of Jolteon and Umbreon. I made these semi-posable figures in part because of all the upcoming Eevee merch, I can't wait! (and because I've been wanting to make a posable figure for some time now XD) So, I hope you enjoy these photos! *Note: The Jolteon is based on an OC which is why she has "point" markings, and different coloured eyes and pawpads.